SynapseIndia Founder & Director Shamit Khemka has been contributing and supporting to the Chandramauli trust for quite sometime now. His role in improving the living standard of the students studying in the trust is remarkable. Several activities are also organized in Shamit Khemka's company to provide more support to the trust. Employees regular contribute clothes, study materials, household stuffs to the trust which on a regular basis is been delivered under the able guidance of Shamit Khemka. Shamit Khemka on his association with the trust says that the trust is making people aware about the Vedic Indian culture and spreading core value of Indian education system. It gives us immense pleasure to be a part of it and contribute to our possible potential. Shamit Khemka also adds that Chandramauli is one of a kind trust that incorporate teaching of "Sat Svar Vedas" together with "Panini's Vyakaran" as well as Saahitya, Darshan, Translation and Spoken Sanskrit. Adding to SynapseIndia CSR Activity, Shamit Khemka provided new hostel building to the Trust. Shamit Khemka is inspired by this great initiative by trust that educate people about our traditional & core Indian values and this made him proudly contributing towards the causes initiated by Chandramauli trust. Right from financially funding to the support of any range possible, SynapseIndia Founder & Director Shamit Khemka has given a helping hand to the trust. Some of the major contribution made towards Chandramauli trust includes overall infrastructural development of the center as well as the inhabitants by providing them study material, apparels, computers, medicines etc. 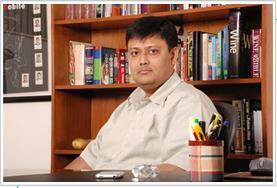 Shamit Khemka is an IT Entrepreneur who leads India's most reputed IT outsourcing organization, SynapseIndia. Besides serving to the responsibilities as Managing director of the SynapseIndia, Shamit Khemka is associated with Entrepreneur's organization (A worldwide community of entrepreneurs) as the Regional Director for South Asia. The community is dedicated to nurture young entrepreneurs with great ideas and provide them a platform that could help them succeed. SynapseIndia Founder & Director Shamit Khemka has been a part of this incredible community from a long time. Shamit Khemka's success story has been driven by his leadership style and expertise in different business areas. SynapseIndia has planned to expand their business globally. As a culture is major force behind the success of an organization, various events & celebrations are held in SynapseIndia to make it the happiest workplace. Company has recently celebrated its 15th foundation day, on this occasion a big event was organized where Shamit khemka announced distribution of tablet devices for employees who had attended the event. Also, the organization has took an intiative to indulge into training programs to empower understudying IT students as well as working professionals. SynapseIndia launched their Training & Internship program that includes sessions on trending web & mobile development technologies. Adding to its services, company has included Nette development & Slim Framework Development. Contributing to CSR Activity, Shamit Khemka provided new hostel building to International Chandramauli Trust. Shamit Khemka has always put efforts to contribute to Shashwat Bharatam, an initiative started by Eternal Hindu Foundation. The foundation has recently chosen him as the mentor for their Digital & Technical team. With IT Outsourcing at its prime, Shamit Khemka attended one of the world's largest tech event, Web Summit. Event was organized in Dublin in November 2015. Many highly accomplished leaders and speakers presented their thoughts which was a key attraction of the event. Shamit Khemka has reacted to the startup action plan launched by Indian government. He believes that program will make easier to do business for entrepreneurs. Shamit Khemka appreciated the Web Summit's first tech conference in India – 'SURGE'. He attended two day event held in Bengaluru. He believes that equality for women is progress for all and supports the initiative to celebrate International women's day event to recognize & appreciate the contributions of women employees. He is committed to maintain a healthy & positive workplace environment at organization where employees can learn, grow and deliver the best.